The Strategic Non-profit Management course is an excellent high-level overview applying established management theory to the non-profit segment. Attending this course has both inspired new ideas for me as well as validated understanding that I’ve been developing in the last year since assuming the directorship of my organization. 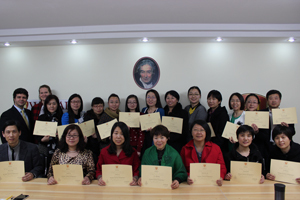 It’s a real blessing to know that gifted minds with generous hearts in WISPAD provide much needed resources to organizations genuinely serving to improve lives and foster community in China. Inspired by William Wilberforce’s legacy of devoted social and public service, WISPAD aims to promote excellence, effectiveness, and integrity in public and social service through its training, research and advising operations. The Wilberforce International School trains public and social servants, conducts research, and provides professional advice on public policies for poverty alleviation and development. 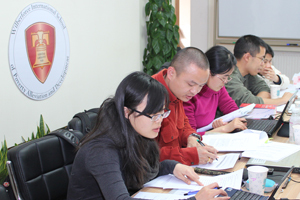 The School offers a unique approach that integrates advanced managerial skills, policy analysis, and implementation tools with an ethical framework derived from Biblical values and morals. WISPAD’s professional and ethical training aims to support the developmental efforts of individuals, communities, nonprofit organizations and governmental agencies in countries with lower levels of political or economic development. The Wilberforce International School of Poverty Alleviation and Development identifies with the effective and ethical form of public and social service exemplified by William Wilberforce (1759–1833) during his political career as a Member of the British Parliament. Prominent fruits of his distinguished public service include the abolition of the British slave trade in 1807 and slavery from the British Empire in 1833, as well as profound and lasting social reforms in England. In times in which politics seems overly tainted by unbridled desires for personal gain and thirst for power, Wilberforce’s ethical and transformative public career stands as a beacon that has motivated generations of public servants. His example is an inspiration to those sharing in the same vision to uphold sacred principles, while bringing lasting social transformations and provision for the destitute in spite of today’s challenges. Why Public and Social Servants. WISPAD’s devotion to relieving poverty and inequality forms the basis of its instruction for excellence, effectiveness, and integrity in public and social service. The School prepares individuals and teams fully committed to address the pressing needs of their communities. This instruction aims to form public and social servants rather than leaders according to the Biblical mandate that whoever wants to become great must be a servant. The School trains students with undergraduate and graduate degrees, scholars with related academic interests, staff from international agencies, executives of non-profit and for-profit organizations, and officers from different levels of governmental agencies to equip them for public and social service.